Photo: Youth worship at Arizona Youth Camp 2016. Incredible things happen when churches sacrifice their own agendas and ministry plans to unite under the banner of Christ. Apart from each other, congregations are making great strides to advance the kingdom. But together, they can do what none could accomplish alone. In Arizona, students and youth leaders are setting the example for their older counterparts. Organized youth gatherings had ceased, yet the need for relational connectivity was palpable. The budget for a major production did not exist but, working together, several churches could make a life-changing convention possible. For the past five years, they’ve made it a reality. “This was actually the fifth year of the event,” Kayla Harden, student ministries pastor at West Side Church of God in Glendale, explains. “But what began as a gathering of two churches has grown to include almost three hundred students and leaders representing six churches.” North Hills in Phoenix and McDowell Mountain in Scottsdale were the two original churches to unite. Since then, the number of students and churches participating has only grown. 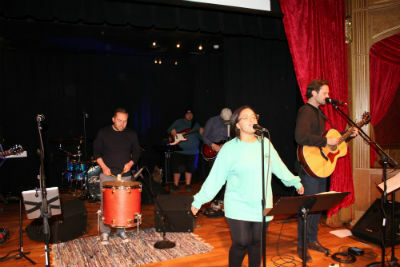 Photo: Part of the united worship band. The band and tech team at Arizona Youth Camp 2016 represented North Hills, McDowell Mountain, Arcadia City, West Side, as well as Mountain Park and The Gathering Place churches of Phoenix. At a beautiful campground in the pines above the quaint community of Williams, Arizona, nearly three hundred students from these churches worshiped the Lord together. 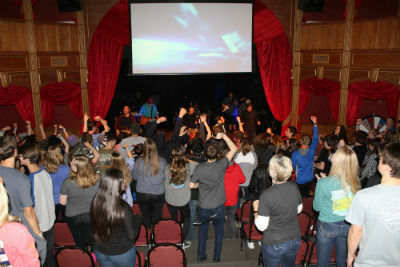 For students, leaders, and camp volunteers, the weekend was a picture of heaven on earth. This single annual event is now fostering connections beyond the camp itself. Kayla describes what is happening as revitalization that only God could bring about. This entry was posted in All Church of God, Western, Youth Ministries and tagged Arcadia City, Arizona, better together, Cody Bracy, Gathering Place, Glendale, Kayla Harden, MCDowell Mountain, Mountain Park, North Hills, Phoenix, relational connectivity, Scottsdale, state youth convention, students, united, unity, West Side, worship, worship band, worship team, youth, youth camp. Bookmark the permalink.